I had a mission president that once taught “There is no such thing as ‘deep doctrine’, there is only true doctrine or false doctrine”. We come to know doctrine as we are obedient to the principles of the gospel. If we want to know ‘why faith in Jesus Christ is essential’, we need to first seek to understand the underlying doctrines. Next, we seek out the principles of the gospel that guide us in how we can exercise our faith in Jesus Christ. As we set forth to obey the principles of the gospel, the Spirit of the Lord will reveal applications, or the way we behave in response to the principles. We might ponder the underlying doctrines and study many scriptures and prophetic counsel on those subjects. As we come to understand the doctrines, we might feel the desire to follow some particular principles of the gospel like repentance. The Spirit might teach us how to repent. We may feel prompted to immediately drop to our knees, to seek out those we may have offended and apologize, or take a walk to a secluded area or perhaps we might be prompted to turn back to the scriptures for further study. The actions we take in response to our desires and beliefs constitute faith. When you receive forgiveness of your sins and know that you are clean before God, you will not only have the answer to your original question, but you will know the truthfulness of the doctrine. As we do the will of God while following the Spirit, we will come to know whether a doctrine is of God or man. How can the study of doctrines influence how we feel and behave? 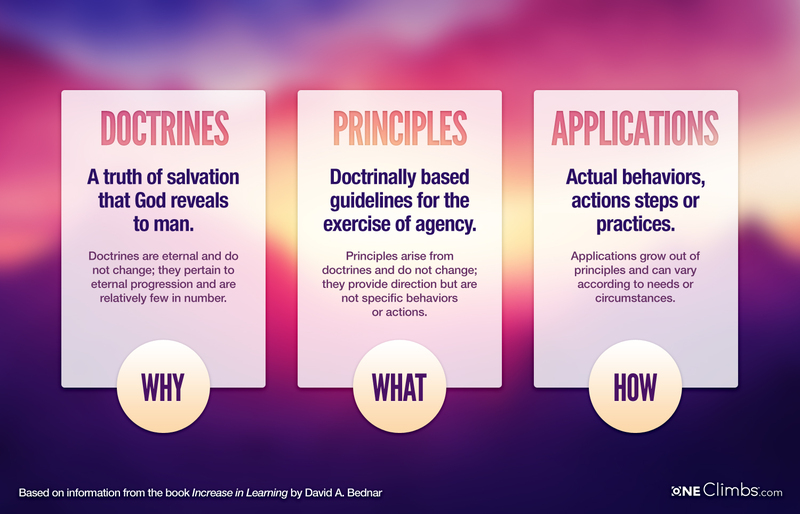 How can the study of doctrine impact what we know? How have certain doctrines impacted your life?